I once met a guy who wanted to work in broadcasting. So he went to college. In his four-year degree, taking some forty classes, guess how many applied to broadcasting? Just three. While having secondary benefit, his other three dozen plus classes were not preparing him for the job he sought, but they did take time and waste money. In my post “Why I’m Against Seminary Training,” I asserted that most people don’t need to go to seminary before they become a minister or missionary. Most of the classes they endure are secondary, taking time that could be used to serve and costing money that could be better spent. The result is often student loans. I’ve talked to many twenty-somethings who desire to give God a life of service, taking a job that may not pay much to do something that gives much, to engage in spiritually fulfilling work with lasting impact. There’s one roadblock: student loans. Their desired job won’t pay enough to cover their indebtedness, so they must take a higher paying job they don’t want and won’t enjoy so they can pay off their debt. Some organizations require post-graduate degrees from seminary or Bible college as a prerequisite. My soul groans when I hear their expectations. A few of those classes may have direct application, but most just amass knowledge with little practical use. When it comes to serving God in a ministry of some sort, debt is a deterrent, and college education is false preparation. What I think God wants is spiritually mature followers of Jesus, who have an intimate relationship with God the Father, and know how to follow the Holy Spirit. That is the real prerequisite, and it isn’t taught in college. 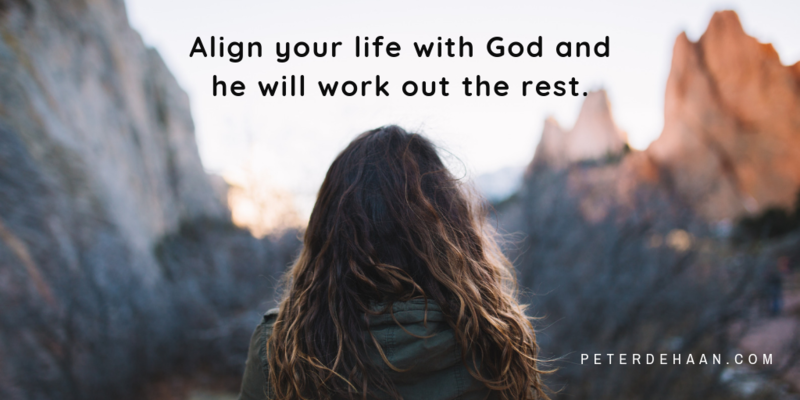 Align your life with God and he will work out the rest. That’s the best preparation for serving him.